How does one define art? Stretching centuries, it is undeniably, not an easy task. The Savannah College of Art and Design, deFINE ART, attempts with a not so subtle play on words, to do just that. At the recent 2016 iteration the College organized several intellectually stimulating panels to correspond with a series of exhibitions that opened at the SCAD Museum. 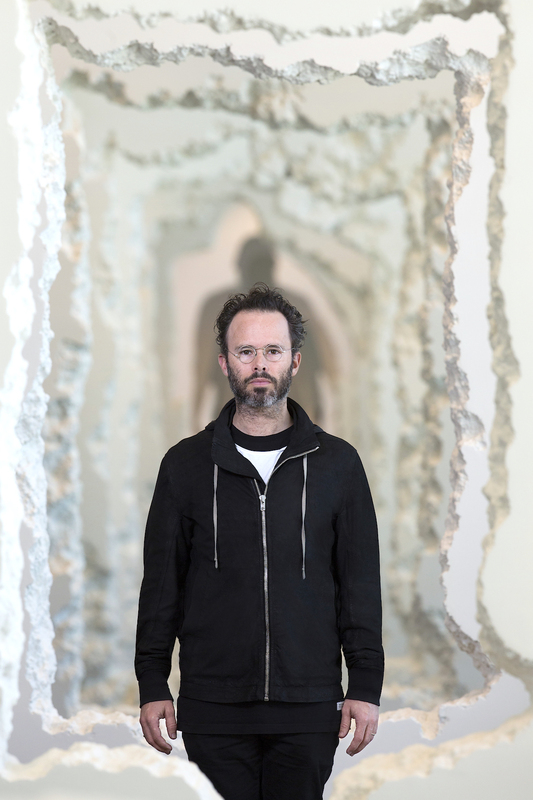 One artist who made a site-specific installation stretching the entire length of just one elongated section of the museum is Daniel Arsham who is represented by Galerie Perrotin, with locations in New York, Paris and Hong Kong. Constructing the piece based on precise measurements, previous sketches and particular spatial confines, Arsham worked in various materials resulting in “Wall Excavation” (2016) a work that extends towards the ceiling and is a visual conundrum, offering what could nearly be a mirage. 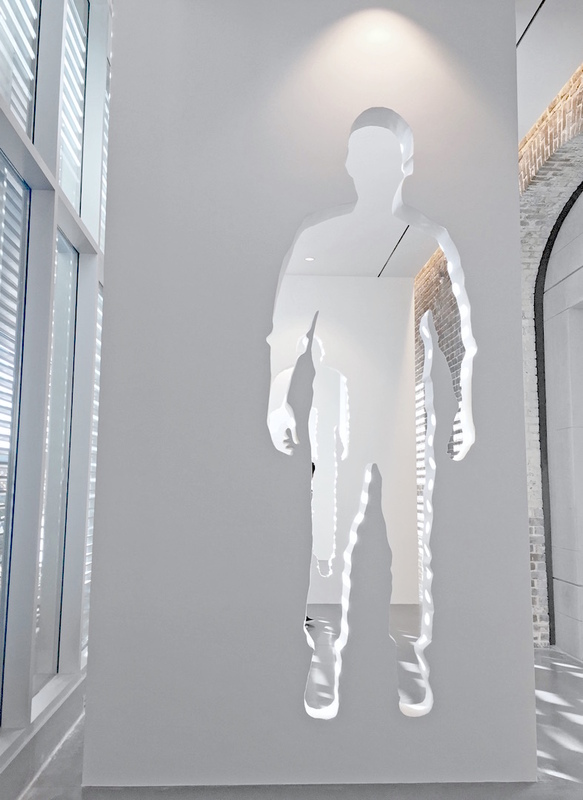 His work often involves the illusion of merging physical artworks with the interior details of the space in which it has been installed, and this work also follows this format. Walking through the the “Wall Excavation” visitors will also come across other works, not site-specific such as “Glass Seated Female Figure” (2016) and “Selenite Eroded Broken Figure” (2015). Curated by Aaron Levi Garvey, both artist and curator were present for a dialogue on this expansive work and our conversation is below. 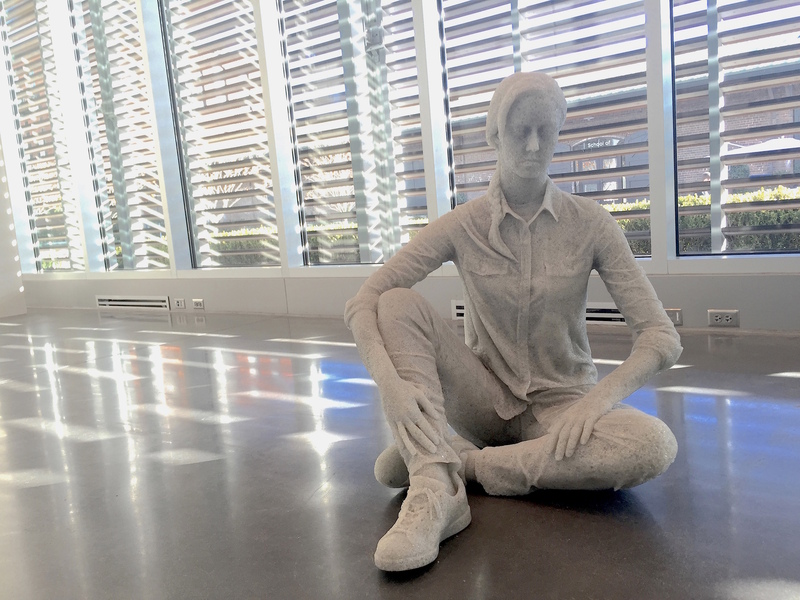 Katy Diamond Hamer: I know you’ve made site-specific intrusions [sculptures] before. Can you speak specifically on “Wall Excavation” (2016) and how it came about? 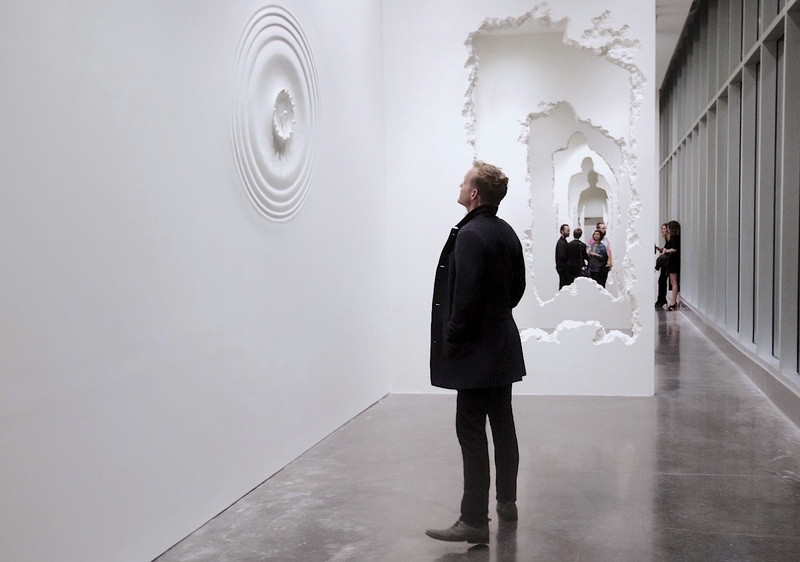 Daniel Arsham: Sure, well, obviously the space is quite unique, at 300 feet long by 12 feet wide. When I visited for the first time I went back to some studies I’d done before that which were a series of planes, that were built throughout the space. It’s based on the Aventine Keyhole (http://www.atlasobscura.com/places/the-aventine-keyhole-rome ) a famous site in Rome designed in 1765 by Italian architect Giovanni Battista Piranesi. When you look through the keyhole it creates a sight-line directly to the Vatican. It’s this really beautiful architectural succession of forms. The piece starts with a perfect architectural form of a cube and ends with the silhouette of a figure. In between is this very irrational breaking, if you will. So that transformation happens throughout the space. One of the most interesting elements of the installation for me is that the walls are all offset. Since it’s been installed, I’ve watched people walking through the piece and while previously it was possible to walk in one straight line through the space, it now creates an oscillation of movement. A different sort of path, essentially has been made. KDH: So even though the ‘keyhole’ shape which changes in dimension but is visible throughout the installation-from one end of the gallery to the other-the walls themselves are not necessarily perfectly aligned? DA: Exactly. From one direction they are aligned to the right and then the left, forcing the viewer to move in a zig-zag pattern from one end to the other. People don’t notice that they are doing that because they are forced to. KDH: Can you say more about that spatial or architectural ‘force’? DA: With all the work that I do with Snarkitecture and paying a lot of attention to architecture there are tricks that we can use to manipulate people’s movement and pacing in ways that they don’t think about. So no one is really noticing that they are doing that. Also, because the space is 300 feet long, by punctuating it, with these miniature rooms, that are able to be used, it somehow also appears to be longer than it actually is. KDH: Do you think the illusion of increased length or depth of the gallery comes from the perfect perspective as seen through the shapes through each wall? DA: It’s [from] the perspective of consecutive forms and the idea of architectural repetition. It’s the consistency of There is the idea of architectural repetition, such as in the stairs of the Supreme Court. When you normally walk down stairs, the pacing is even. Those stairs are off. And the reason is that when you are walking up or down them, you are forced to take a pause, forced to pay attention. KDH: What else can you say about the shapes cut through each wall fragment of the installation? The starting and end points have an identifiable recognizable shape cut-out, but much of the other forms seem to have been made quite organically. DA: The whole work to some extent, is related to architecture and us. In the middle it becomes quite messy. There is a transition between the architectural form and us. It also borrows the language of erosion from some of the previous work that I’ve done, including things that approach the natural but still feel quite accidental. KDH: Aaron, what are your thoughts on the various shapes, from a cube to a human form, that evolve throughout “Wall Excavation”? Aaron Levi Garvey: I think you’ve hit it right on the head using the word “evolve”. For me, it is indicative of mankind’s evolutional path to industrializing the world we live in today. Having the cube at one end and the figure at the other, really shows both physically and metaphorically how far mankind has come from using handmade tool and chipping rocks, to building monumental skyscrapers. Just as the exhibition title suggests The Future Was Then, referring to those singular moments throughout history when craftsman and craftswomen stumble upon instances of innovation and take mankind into the next level of cultural evolution. KDH: I also like to think that it looks like or functions like a drawing. I like looking at three-dimensional space as if it were in a two-dimensional confine. The way that I look at art, I could almost visually flatten the work, or think of each of these free-standing walls as a drawing. DA: Well, they started that way. As a drawing that was plotted on each wall and then cut-out. KDH: This work is site-specific and has never been shown before. DA: Each panel was carved with a saw and the additional chunks of material were knocked out with a hammer. The interior is a very dense foam and the exterior has been coated in plaster. It was built here just for this exhibition and will be destroyed at the end. It’s harder to move than to recreate. KDH: What do you have to say, Aaron, about the relevance of a site-specific artwork that is meant to be destroyed at the end? ALG: Its simple: build, evolve, destroy, innovate, rebuild. KDH: What was it like for you working with Daniel for deFINE ART? I know you’ve wanted to collaborate with him for quite some time. ALG: I first approached Daniel about this exhibition a few years ago and as we were talking, the conversation naturally segued into our shared interests of transforming spaces. Mine, in creating atmospheric and experiential exhibitions and Daniel’s with his affinity with architecture and transformative landscapes. Once I told Daniel about the two spaces that we could consider for the exhibition and looked at images, we were both partial to the linear 300-foot space. Working together was a pleasure, definitely looking forward to the next time. 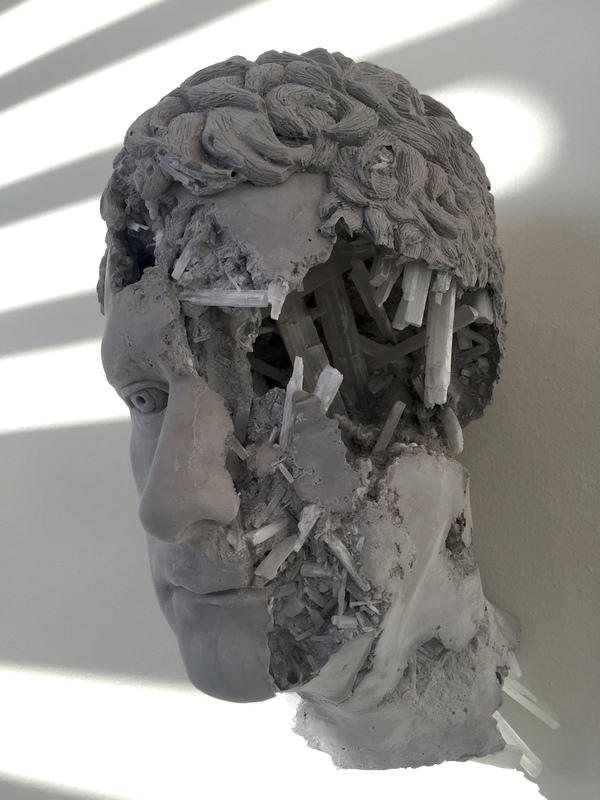 Daniel Arsham, The Future Was Then, curated by Aaron Levi Garvey will be on view at the Savannah College of Art and Design, SCAD Museum of Art until July 24th, 2016. He also has an upcoming solo exhibition with Galerie Perrotin, New York, in September 2016.